On this date in 1917, Edwin Dyett was shot for desertion and cowardice. After the disastrously ineffective Somme offensive in late 1916, British Field Marshal Douglas Haig decided to pick up the men’s spirits. And what better way to motivate than by shooting more officers? If one proceeds from the premise of the British brass that the main problem with its military ineffectiveness was the men in the field, there was something in the cruelly “progressive” about the order: luckless enlisted fellows from the lower classes were smoking last cigarettes by the bushel, but gentry-stock officers were more liable to get the kid-gloves treatment . Haig was taking the kid gloves off. “A soldier’s tale cut in stone to melt all hearts,” said Winston Churchill of this pathbreaking novel thought to be based on Edwin Dyett. The first novel about executed World War I deserters, it is thought to have influenced later portrayals of such executions and the sub-heroic literary context for the Great War. Within two months of that order, our man Dyett was up against the stake at St. Firmin, France — perhaps the most famous shooting among the officer corps. Perhaps presuming upon the traditional leniency extended to the better classes, Dyett had little inkling of his fate during the weeks after his arrest. 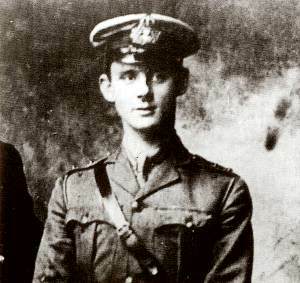 He’d been collared during the aforementioned Somme campaign for “deserting” for two days when he’d taken umbrage at being directed to the front by an inferior officer and instead returned to headquarters for orders. That sitting, however, occurred forthwith on Boxing Day, with only a half-hour for the defense to prepare. That defense was less than robust, and the court clearly disinclined to a sympathetic reading of the circumstances. Lt. Dyett had only a single evening from hearing the bad news to prepare himself for what must have seemed to him a shocking turn of events. This time, he posted a different sort of missive to the home front. Dearest Mother Mine, I hope by now you will have had the news. Dearest, I am leaving you now because He has willed it. My sorrow tonight is for the trouble I have caused you and dad. Please excuse any mistakes, but if it were not for the kind support of the Rev. W.C. — who is with me tonight, I should not be able to write myself. I should like you to write to him, as he has been my friend. I am leaving all my effects to you, dearest; will you give a little — half the sum you have of mine? Give dear Dad my love and wish him luck. I feel for you so much and I am sorry for bringing dishonour upon you all. Give — my love. She will, I expect, understand – and give her back the presents, photos, cards, etc., she has sent me, poor girl. So now dearest Mother, I must close. May God bless and protect you all now and for evermore. Amen. Dad didn’t take it with the stiff upper lip; after a futile campaign to clear the boy, he renounced his citizenship and emigrated to America. The Shot At Dawn site dedicated to executed first World War soldiers maintains a detailed (and very pro-Dyett) page about our day’s principal. There’s also a recent nonfiction book, Death for Desertion, which pleads Dyett’s case. This outcome was a tragedy, but the greatest tragedy of this conflict was the incompetence and the intransigence of the General Staff. Dyett without doubt wasn’t guilty. What guys like Davies above fail to mention is that the death penalty was handed for as much as not doffing your cap. Or that Germany or Australia were quite able to maintain fighting without any such death penalties. I noticed that Davies’ kind usually excuse this with “the law at the time”. A lot were shot who were at war against the law of the time (minors under 19! ), curiously that never counts for anything. A lot were shot who very clearly were insane, and this was known, including to officers and M.O.s. They had order not to declare people shell-shocked AT HAIG’S DECISION. Go yank someone else’s chain. If already during the war people criticised this practice, if directly after the war such books as Herbert’s were published, then no one can sell me that this whole practice wasn’t a class-driven brutality already then not generally accepted and hence rather doubtful “law”. Edwin Dyett was not accused of cowardice but only desertion. I have done a talk based on Leonard Sellers’s book ‘Death for Desertion’ a number of times in which I give the background to the attack, go through the evidence given at the court martial and then divide the audience into groups and ask them for a verdict and, if guilty, a sentence before telling them what actually happened. Between 80 and 90% of these ‘panels’ give a verdict of guilty although very few impose the death penalty. There is no doubt Dyett deserted, he did not go to the front when ordered and wandered round in the rear for 36 hours – and failing to report the presence of a group of wounded men – thus absenting himself from ‘a dangerous duty’. This constituted desertion. Whether he was fully in control of his actions, he admits he had weak nerves, is a question but no evidence was given on this point at the court-martial. Dyett was certainly guilty and as officers and NCOs normally received a heavier punishment than private soldiers because they were the leaders a death sentence was not surprising. Had he been cashiered he would have then been conscripted, what would then have happened we do not know. Some of his actions indicate that he may not have been fully in control of himself but no evidence was given at the court martial on the point and as it was his first action he is very unlikely to have been shell shocked. Probably he should never have been commissioned a view which tends to be confirmed by comparing his actions with those of Lt Truscott who was sent forward as a replacement at the same time. What does ‘not full in control of himself’ even mean in this context? So much of the evidence I guess you present your students with is little more than conjecture concerning subjective assessments of a 21-year old naval officer’s state of mind at the time. How can you assess whether or not someone is ‘shell shocked’ on the basis of their first action? There are other issues at work in the case to do with the comparable status of who ‘ordered’ who and deeply held grudges, which I suggest, lend just as much ‘evidence’ to the case as your perception that he had weak nerves or was so certainly ‘guilty’. I wonder how objectively the evidence is presented to your students who seem to unanimously find him guilty? Also, your opening sentence clams he was shot for both desertion and cowardice, which you contradict later in your reply to Anna above. What drives you to put this man on trial again? Are you a descendent of the Truscott to whom you compare him? Haig and his kind were mindless murderers. Even with a pardon in 2006, this did nothing to compensate the effect that these murders had on families for generations. This man was no coward. He deserve a pardon. I read a very good young adult novel called Private Peaceful about a young soldier who was executed in WW1 under similar circumstances. Until I found that book I had been unaware of this problem in history.